"Recipe passed on from my Italian grandfather. The ultimate comfort food. Leftovers freeze nicely! To make this recipe more authentic, you can use a mixture of ground veal, pork, and beef. You can also substitute the balsamic vinegar for 1/2 cup of red wine." Bring a large pot of lightly salted water to a rolling boil. Cook the spaghetti in the boiling water until cooked through yet firm to the bite, about 12 minutes; drain. Heat the olive oil in a large pot over medium heat. Cook the bacon in the oil until crisp, 8 to 10 minutes. Stir the onion, celery, carrot, and oregano into the bacon; continue cooking until the vegetables begin to soften, another 8 to 10 minutes. Add the garlic and cook until fragrant, about 2 minutes. Crumble the ground beef into the vegetable mixture; cook and stir until the beef is completely cooked and no longer pink, 8 to 10 minutes. Pour the balsamic vinegar over the ground beef mixture; allow to simmer until the liquid evaporates, about 5 minutes. 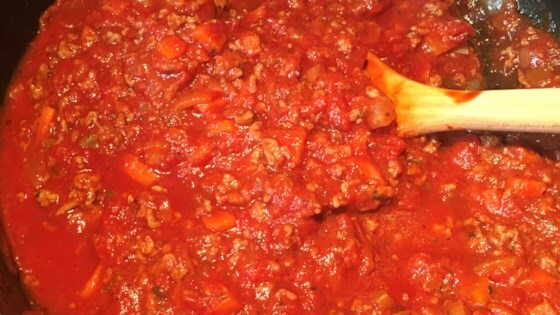 Stir the crushed tomatoes, tomato paste, and sugar into the ground beef mixture; bring the mixture to a boil, season with salt and black pepper, and remove from heat. Stir the fresh basil into the mixture. Ladle the sauce over the cooked spaghetti. Top with Parmesan cheese to serve. A really excellent recipe. I was skeptical about the basalmic but it really worked. My only addition was a splash of red wine at the end. Delicious a definite keeper. This was excellent. I loved the bacon flavour. My husband loved this too. Thanks so much for sharing!